A. You find yourself secretly daydreaming about your summer vacation plans. B. You started the daily countdown to summer way before your students. C. You stare longingly out the window while your students are taking quizzes. 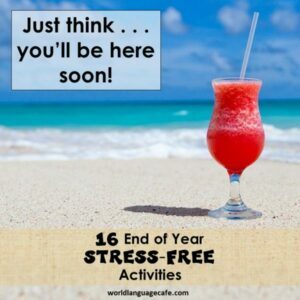 No worries, I’ve got you covered with 16 French and Spanish end of year review activities and games that require very little effort on your behalf. And the best part is . . . that the students will still be learning! 1. 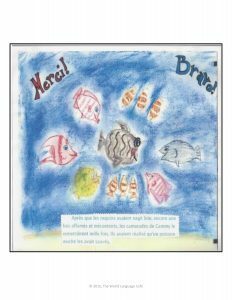 Instead of you creating French or Spanish end of year review packets for the final exam, have your students make them. * The group prepares a review game of their choice that covers all of the material from the unit. They will briefly reteach the grammar to the class and then lead the class in playing the review game. Create a grading rubric, correct the rough drafts of the study guides, correct the final copies with their corrections of the study guides, make copies for the class, and grade their presentations. Your rubric might include: initial grammar, final grammar, grammar instruction (all in the target language, accuracy, class engagement), and review game (speaking all in the target language, creativity, preparation, grammar). At this point in the year, your students really don’t want to listen to you, but they will listen to their peers. Also, you know what they say, “You really learn a topic well when you teach it.” At the very least, they’ll know one unit really well for the final exam even if they don’t study at all. By this time of the year, the kids are bored with the same games. Throw a few new games into the mix to re-energize your class. Most times, the students can run the games themselves – just pick a student to be the teacher and then rotate through other students during the game. The kids love getting to be the teacher and this works well, because at this point in the year, they’re more likely to listen to a peer than to you. Your students will be learning and reviewing while you are grading papers or preparing final exams. And guess what? 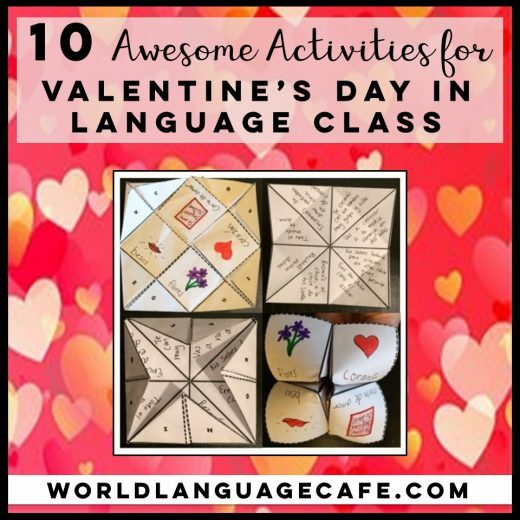 I’d love to share some 50 of my favorite World Language games and activities with you. Trust me – there are some really fun, engaging games in here that will really get your students up and moving. And did I tell you that they’re free? 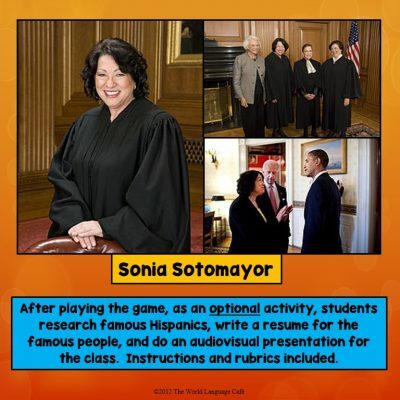 Sign up here to get them and other engaging lesson plans in my Free Resource Library. I do this every year with my juniors and seniors – it’s a great way to put everything that they’ve learned throughout the year to good use. You’ll be amazed at how much they learn. 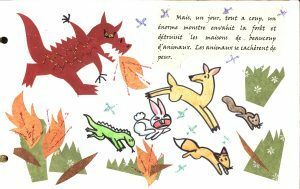 Read a fairy tale or two in the target language to your students (or have them take turns reading one aloud). Discuss the elements of fairy tales (description of the characters, fantasy, some sort of adventure/challenge that the characters face, a moral, etc.). This will help prime them and spark them imagination for the project. Students divide up into small groups of 2-3 people. Let them pick their partners for this project because they’ll need to coordinate times to work together outside of school. Students write the fairy tales, then do peer edits, you check it over and highlight parts which need fixing, then they write a final draft and you check it over once more and fix any remaining errors. They create the actual fairy tale book with illustrations. You may be thinking that some students aren’t very good at art, but they really don’t need to be. There are lots of ways to do illustrations without a lot of drawing. I encourage my students to use everyday household items to make their illustrations pop. 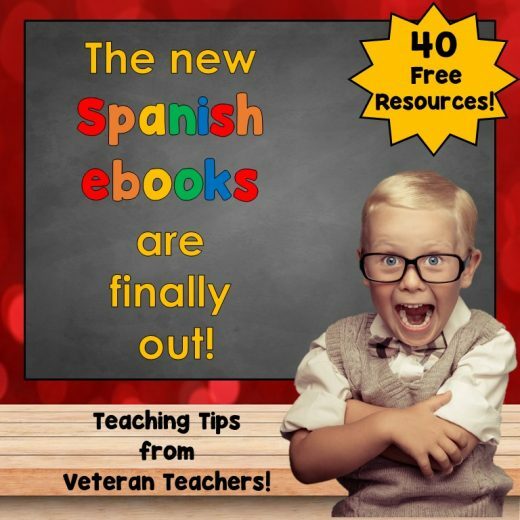 Want detailed student instructions, a step-by-step teacher guide, plus peer edit sheets, grading rubrics, and 100 transition words to help your students write more fluidly? You can get the French and Spanish versions for just $5. Pretty worth it for 2-3 weeks of student work. Spend one class period a week having a language cafe. Each week, a few students prepare a traditional dish or treat from a country that speaks the target language. They are responsible for bringing enough food, utensils, napkins, etc. for the whole class. After everyone has their food, the students explain in the target language which ingredients they used, how they made it, and where it’s from. Prepare themes/questions ahead of time and make a copy for each group. Base the themes loosely around whatever grammar points, vocabulary you’re working on at the time. For example, if you’re studying the future tense, one of your questions might be, “Imagine your life in 10 years. Where will you live, what will you be doing. If you’re studying the conditional tense, ” What would you do if you were the principal for a day?”. They will use these as conversation starters for their discussion. Then divide the classroom into 3-4 groups to discuss different questions/themes. One person in each group will be the recorder who makes a mark next to each person’s name that speaks, 1 point for answering a question, 2 points for asking follow-up questions. This gives the students incentive to speak in the target language and to keep the conversation going. Another person will be the moderator, in charge of keeping the discussion on track and asking questions of anyone who isn’t speaking a lot. The whole point is to get the students speaking in the target language and talking in real life situations. This is always a favorite activity in my classes. We actually do it all year long because it’s such a valuable activity. Love it when they can be learning and having fun at the same time! 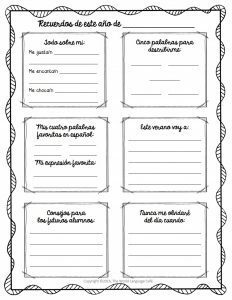 These are called interactive notebook flashcards (either regular style or Spanish trifolds or French trifolds), but they can be used with regular notebooks, too. 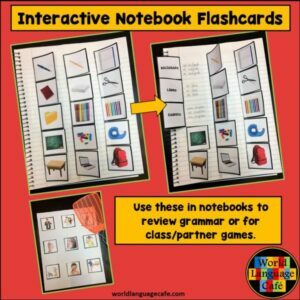 If you’re looking to review a certain vocabulary theme or verb tense with your students, check out these flashcards which can be used for games, for individual student practice, as sub plans, or for homework assignments. 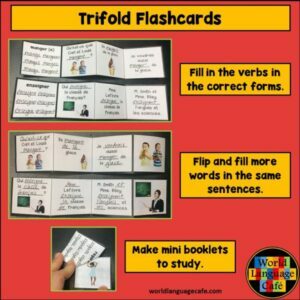 Here’s a video explaining what trifold flashcards are and how to use them or you can check out my blog posts about them: why traditional flashcards just don’t work and revolutionize the way that you teach verbs, vocab, and grammar. * What was your favorite game that we played this year and why? * What topic was the hardest to learn and why? Do you have any suggestions on making it easier for future students? * What do you feel that your teacher could have done better to help you learn more this year? * What do you feel are your teacher’s strengths? Compile the answers from that last question and keep them on a sheet called: Here’s What My Students Say about Me. This is an awesome tool to whip out during any future teaching interviews that you may have or to keep in your teaching portfolio. Students love to do things that they know. Use the results of your survey (or do a quick class poll to find out which game was their favorite) and try to incorporate it into your end of year review activities. This time, let them come up with the game questions or be the teacher for the activity. Level 1: Make a poster showing the flag, a map that shows where the country is in the world, a few photos, and some facts about the people or culture. This food component can be used for all the levels. Students research a specific recipe from the country, prepare it, and share with the class. Perhaps you can even use the home ec kitchen so students can cook together. Here’s a great post from Sarah Barrientos Svatos about cooking at school with students. Level 2: Pretend you just visited the country. Describe your journey using the preterite. Students incorporate information about landmarks, historical, cultural and tourist places, events, celebrations, and of course, the food they ate while they visited. Level 3: Same as above, but using the preterite and imperfect. This amazing idea came from Lucy Garcia-Fischer. She’s part of our World Language Cafe FB group. Come join us in our online World Language Teacher’s lounge where we share ideas, humor, and teaching tips with teachers from all over the world. Kind of like a yearbook page except in the target language. Here is a sample of the one I use. You can get it in French or Spanish. Students really enjoy thinking back on what they’ve learned this year and sharing it with future students. 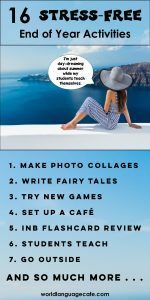 This activity makes them feel like they are older and wiser and helps solidify study skills and good learning habits that they can use in next year’s class. It’s fun to save these letters and show them to your new students next year. Divide them into small groups and give each group a few topics from the year to cover in their games. Have them prepare their own games for class. Spend a day or two playing the games. At least here in the Northeast U.S., everyone is itching to be out in the nice weather. Bring your class outside. It’s usually just as easy to do whatever activities you had planned outside and the kids will adore you for it. Or go on a walk and learn new vocabulary for what you see outside. Have students find photos or draw pictures of things they find around the school or outside. For example, students can try to find: something metal, something made of wood, something that’s alive. Make the list in the target language and students must find the items and take a picture of them. They write a few sentences explaining or describing what they found and then share with the class. Tech Variation: Students download the free PicCollage app and they take a picture of the page that has the hunt list and insert that as their background image. Then they can layer the images on top to create their collage. Afterwards, they can put the image in a PPT file and record themselves saying a few sentences about each item. Another option is to have each group write a few sentences about each item and overlay the text on the photos. Work through the editing process with them and then post these around the class. Let’s be honest. At this point in the year, students have no interest in listening to us anymore. So I say, “Let them teach”. After all, they do say that the best way to learn is by teaching. 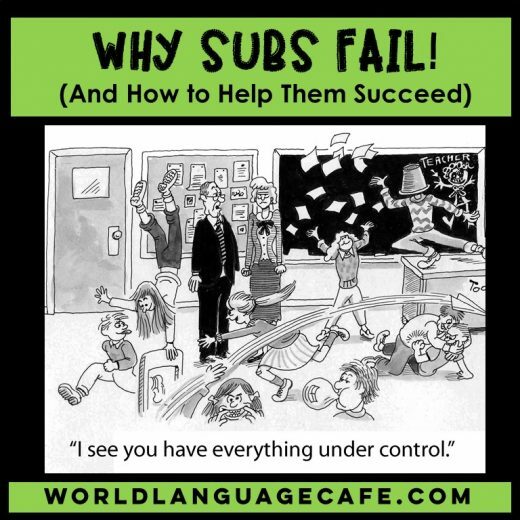 Now, I’m not saying that you should put your students in charge of teaching the subjunctive tense, but you can definitely put them in charge of teaching vocabulary or planning a mini lesson or review game. Have students write 20 clues about a famous Hispanic or Francophone person. Then they read their clues aloud one at a time and students try to guess who the person is. You’d be amazed how well this activity works to review sentence writing skills. For more advanced students, have them write a resume (curriculum vitae) for a famous person and present information to the class, along with an audio-visual component. Want 20 clues for 25 famous people that you can use right away with your class and the rubrics and instructions to go along with them? Get them here: French version, Spanish version. These also make awesome sub plans! OR select a few songs in the target language for the students to transcribe and teach to the class. Try to pick songs that are easier to understand, not too fast, and that have some deeper meaning/culture to them. Divide the class into groups of 2-3 and give each group a song to work on. Their assignment is to listen to the song and write down the words. 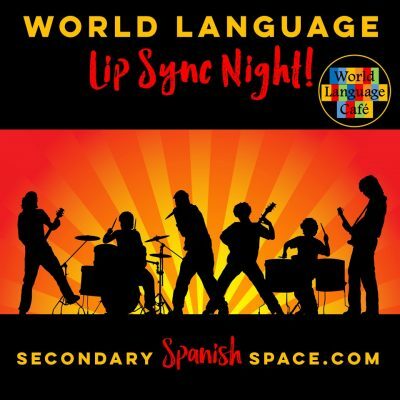 Then they should select 5 vocabulary words from the song to teach to the class in the target language and come up with a gesture for each word so that when the class hears the key words, they do the gestures. They prepare a presentation explaining some biographical information about the singer/band, 5 questions to ask the class, and an explanation of the meaning/significance of the song. 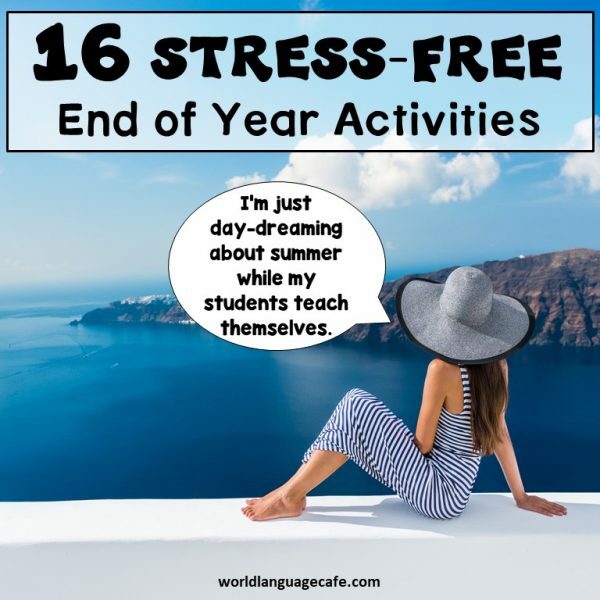 Hope these French and Spanish end of year activities make your life easier and keep your students engaged and learning these last few months. 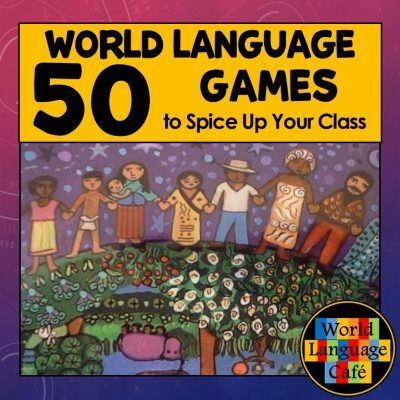 Remember to get your Free World Language Games by signing up below.